How do I know if the river is too high to paddle? The water level of the river is measured by its discharge in cubic feet per second (cfs) and can be found here. We recommend novice paddlers don’t go out above 5,000 cfs, and everyone else not above 8,000 cfs. Above that, there are no sand bars available for rest stops. 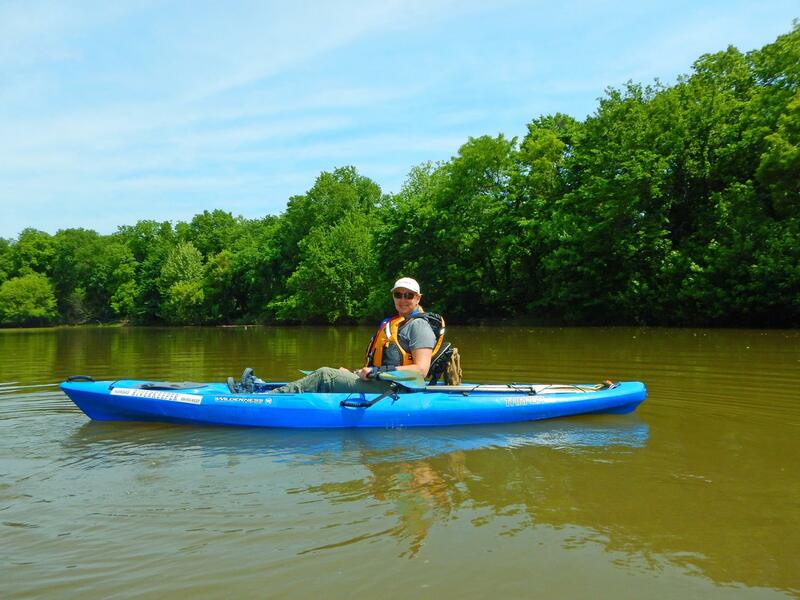 The Kansas, Arkansas, and Missouri Rivers are all public rivers in Kansas, meaning you can paddle, camp on a sandbar, and fish without a special permit required (although you do still need a fishing license). More information about the Arkansas and Missouri Rivers can be found here. In addition, rivers on federal land are also open to the public. This includes the Wakarusa, Rock Creek, and Delaware River, all of which have boat ramps on our river access map. All boat ramps on the Kansas River are open to the public. There are boat ramps about every 10 miles along the river (with the exception of De Soto to Cedar Creek and Belvue to Kaw River State Park, which are 5 and 29 mile stretches, respectively). How long will I be on the river? We estimate it takes about 1 hour to paddle 3 miles, so for the 10 mile stretches plan on paddling for about 3.5 hours. Be sure to factor in the time it takes to load and unload your boat at the boat ramps when planning a trip as well as stops on sandbars. Can I rent a boat from Friends of the Kaw? You can rent a boat from us if you’re attending one of our paddle trips (see below). Unfortunately, for an individual trip you’ll have to go elsewhere. You can find a list of boat rental groups here. What should I bring/wear on the river? You should always have a PFD (personal flotation device) and wear it at all times. In addition, it can get pretty hot on the water, so wear a hat and sunscreen, and bring water (we recommend every person brings at least a gallon of water). For clothing, denim and cotton can get heavy when wet so we recommend wearing lightweight materials like nylon and polyester. You should also wear shoes that are sturdy (no flip flops or loose sandals) and can handle getting wet and muddy. As far as equipment, we recommend bringing an extra paddle, a cell phone in a dry bag, hand sanitizer, and a first aid kit. What are the paddle trips? Friends of the Kaw offers guided educational tours along most sections of the river. We provide the canoes or double kayaks, PFD, basic instruction, safety information, and an educational sandbar seminar (with food!) mid-way through the trip. Which paddle trips can I join? Any trip you’d like if you have a canoe or kayak! Some paddle trips are named after the group that reserved that day, but you’re still welcome to join if you have your own boat. In addition, there are four (4) public events per season called Let’s Paddle the Kaw trips and also County Cleanups which both solely consist of individual signups. Do I need prior paddling experience to join a trip? Not at all. We have many beginner paddlers join us, often for their first time on the river. On every trip we have experienced Paddle Assistants that help you into the boat, answer any questions while paddling, and help you out of the boat. How much are the paddle trips? For any county cleanup paddle, participation is free but space is limited so be sure to sign up early. For all other paddle trips, we ask for a $30 suggested donation per person to use our boats and a $5 donation if you bring your own – all to help keep the program running. I signed up for a trip! Now how do I get information? We send out an email to all participants the Wednesday before a trip that contains all relevant details about what to bring, where to meet, how we’ll transport people back to their cars at the end of the trip, etc. What happens if a paddle trip gets canceled? There are three reasons a paddle trip could be canceled: lack of participation (we need at least 16 people), the water level being too high, or bad weather. If any of those situations occur, we will keep everyone involved up to date via email. Sometimes we’re able to move the trip to a different location or reschedule to later in the season. Sometimes we’re unable to do either and we have to cancel entirely. If that happens we will give refunds (although the donation is still welcome!). We ask that you RSVP to riverkeeper@kansasriver.org with the subject line “Paddle Trip Reservation” to reserve your spot on the trip (be sure to specify which trip and if you have a preference of canoe vs. double kayak). Email is the easiest way to make sure you receive all relevant information. Yes! If you have your own boat and a way to transport it then you are welcome to join us. We do still ask that you RSVP so that we know how many people to plan for. Can I bring my dog on the trip? We ask that you leave all furry friends at home. It’s great that people are getting their pets outdoors, but unfortunately with the large amount of people on our trips it’s impossible to predict how animals will interact with each other and with fellow paddlers.